We first looked at laser triggers last Summer. These devices have enabled photographers to bring us into a world that moves too fast for our eyes to see. The basic mechanism behind them will either fire a flash or trip the camera’s shutter to freeze the action when the laser beam is broken. After perusing those photos, we knew we had to try a series of photo projects based on these devices. 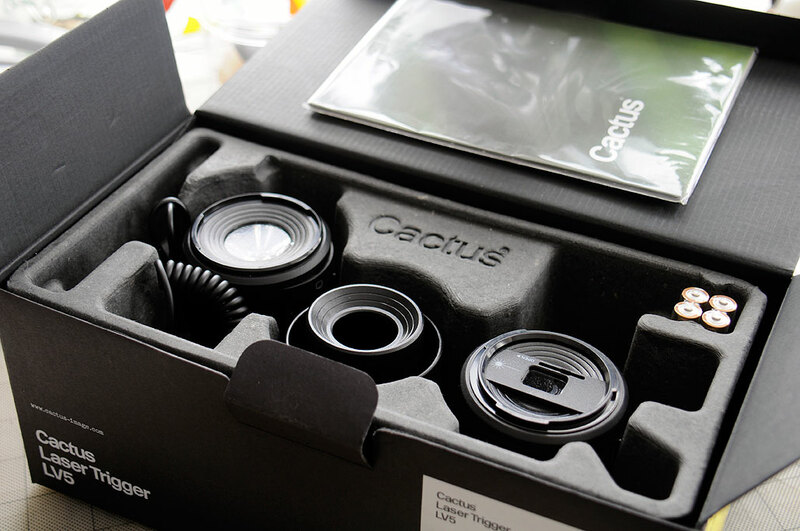 The heart of the Cactus LV5 system is the laser emitter and receiver modules. The emitter has two user-selectable laser frequencies. The receiver module can detect those laser frequencies. Once triggered, the receiver can transmit on one of sixteen different 2.4GHz radio channels to fire a flash or camera in various modes. Each module can hold four AAA batteries but surprisingly will function with only two. We normally would be using eneloop rechargeables. However, we recently learned that Amazon has branded a line of rechargeables very similar to the eneloops. We will take this opportunity to give the Amazon batteries a try. 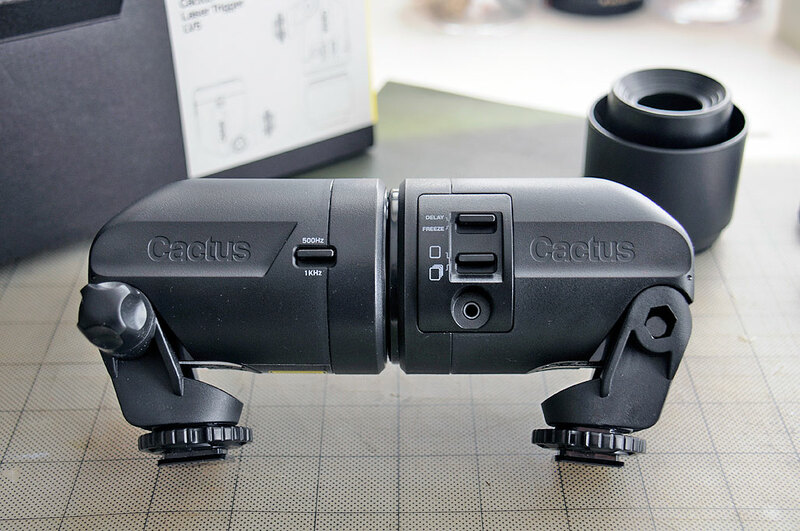 The Cactus LV5 is a Class 1 laser device which is able to trigger the camera’s shutter, either by a wired connection or wirelessly via the embedded Cactus V5 RF module. Since the LV5 runs on the same channels as the Cactus V5 , it can also trigger flash units equiped with those transceivers. The LV5 has two triggering modes, Trap and Escape. The Trap Mode triggers when the laser beam is broken by an object. The Escape Mode triggers when the object unblocks the laser and beam is detected by the Receiver. The LV5 can be set to fire the camera in single or multiple shots. 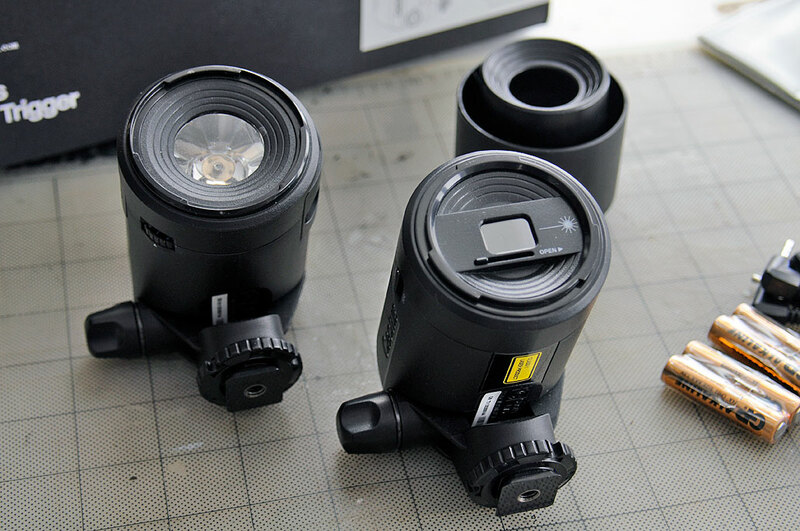 Both modules of the LV5 are threaded to mount on 1/4″ standard tripods. We are working on a rail setup so the modules may be easily positioned and aligned. More on this in a future article. 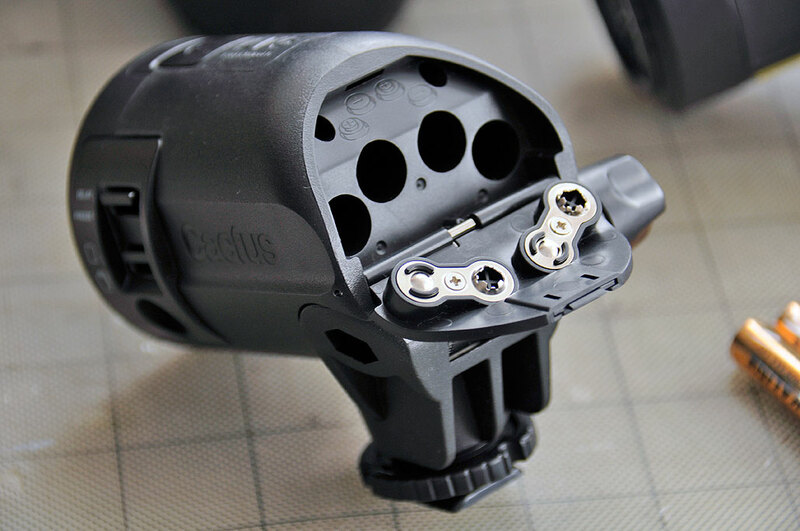 In the meantime, we will be using regular tripods to support these units in for the FirstUse shoot. The range of the laser trigger is approximately 20M when used in daylight and 150M in the dark. A hood is included to provide extra shielding to block out ambient light. The 1KHz frequency is for normal operation and the 500Hz for when there is interference. For storage, the two unit may be mated together to act as a protective cover for each other. No lens cover necessary. Very clever 🙂 We will be looking for a suitable transport case for the Cactus LV5. The waterproof ones from Pelican and S3 are obvious choices, but we are going to see if we can come up with something less conventional, yet still practical, solution. If any readers have any suggestions, feel free to send it our way. We’ll make sure you get credit for the suggestion!